At Hawthorne Auto Clinic we've always been committed to providing full health care coverage to our co-workers and their families. However the cost of health care premiums has risen to an unsustainable level. Something must be done to control the cost of health care. 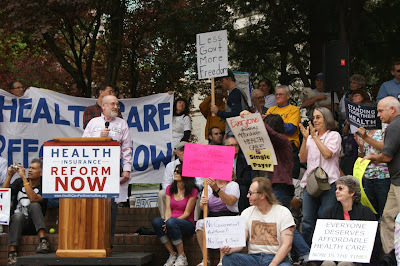 On Saturday, August 29th, a major health care reform rally, attended by over 800 people, was held in downtown Portland at Terry Shrunk Plaza. Our own Jim Houser was asked to address the group on behalf of Oregon small businesses. Following is the text of his remarks. When my wife, Liz Dally, and I opened Hawthorne Auto Clinic 26 years ago we made the commitment to offer those who worked with us a good benefits package, including comprehensive health care. Health care is a major issue for small businesses like ours, and especially for those of us in the auto repair business. We're in a high-skill field where being able to offer good benefits to keep good people is very important. Plus, we're an aging profession. These factors make health care critically important. We offer full health care coverage for all our regular employees and their families, but the premiums far outstrip any reasonable cost for what we receive. Our staff's health care premiums now exceed 18% of payroll. A 100% increase over the last 8 years. Good health care coverage helps us keep good employees but the increased cost of health insurance premiums is unsustainable. When President Obama announced he was going to make health care reform an early focus of his administration I was suddenly hopeful. When I was contacted by the Oregon Small Business Council I saw the opportunity to become involved. And when the U.S. House Tri-Committee proposed their comprehensive health care reform bill that included a strong public health insurance option, I was committed. The Oregon Small Business Council, with over 400 members statewide, is an affiliate of the national Main Street Alliance with over 9000 members in 20 states. Earlier this summer the Main Street Alliance provided the opportunity for 3 members of the OSBC to join 60 other business people from around the country to travel to Washington, DC for 2 days of meetings with each of our states Congressional delegations to lobby for meaningful health care reform. I would like to take this opportunity to thank Senator Merkley and Representatives Wu, Schrader and De Fazio for making themselves and their staff available to listen to our concerns and answer our questions. I was especially proud that our own Representative Earl Blumenauer agreed to host our Main Street Alliance town hall meeting attended by all 60 plus delegates. One final observation. There are some in Congress who argue that increased government regulation of the for-profits insurance companies with their policies of exclusion and rescission, will be sufficient to control bad practices. They say the additional competition provided by the public option isn’t necessary. But this is what I know. In most of this country, and in most of Oregon, health insurance is provided by a monopoly, by cartels. I ask you to consider our own for-profits electric power monopoly PGE, which is regulated by the Oregon PUC. Last year PGE’s CEO, Peggy Fowler, received a whopping $4.3 million dollars in compensation. Across the Columbia River in Vancouver electric power is provided by the publicly owned Clark PUD. Clark PUD’s highest paid executive, Wayne Nelson, made do with $220,000 dollars in compensation last year. Government regulation of a monopoly is never going to provide the same level of cost control that competition from a strong public option will provide. In closing, I thank you, and those who work with me at our shop thank you, for such a large and committed voice for real health care reform, including a strong public health insurance option.